Detective Superintendent Sandra Pullman (Amanda Redman) and her team of retired ex-cops continue solving the Met's unsolved crimes in Season Eight. Sadly, the series seems to have lost its edge. The personal character arcs are becoming tiresome. This time Jack (James Bolam) is moping around for no apparent reason, being moody, distracted, and grumpy. The various cases the team are tasked with are mediocre at best. In one, the team is forced to re-investigate the death of a paleontologist whose death was originally ruled accidental. The medical examiner in the case is currently under investigation for being incompetent (ie: too drunk on the job to have done it properly). No one, including this viewer, really cares one way or another how or why he met his death. A big, bad oil company may be involved. (Been there, done that...) Illegal fossil trading may be involved. (Nothing new there either.) Sigh. The only episode to stand out, and just barely at that, involves the disappearance of a scientist highly respected for his work on cold fusion theory. As he travels by train to a scientific conference, the man is clearly seen on a security camera heading to the dining car but disappears in the four seconds it takes to leave the one train car and enter the next. The ending was a bit disastisfying but the overall explanation of what happened, how and why, was interesting. Currently, this DVD is available only for UK viewers or non-regional DVD players. 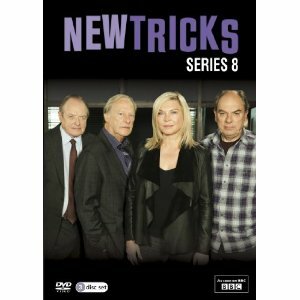 The ninth 10-part series of New Tricks is currently filming at Pinewood Studios and on location in London. The series will return to BBC One later this year. Denis Lawson is replacing James Bolam. Lawson's recent television credits include Holby City, Criminal Justice and Marchlands. He is also known for playing Wedge in the original Star Wars film trilogy. Bolam has said he is tired of the series and feels it has gone flat. I agree.